Entdecken Sie die lebhaftesten historischen Viertel von Harlem bei einem 3-stündigen Rundgang durch die 125. Straße und den Mount Morris Historic District mit Mittagessen. 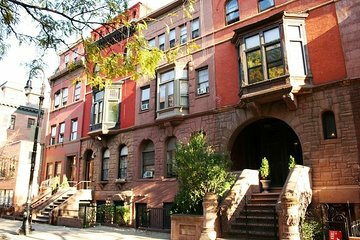 Folgen Sie Ihrem Guide durch das Beste aus Harlems eleganter Architektur und erfahren Sie die Geschichte der Intellektuellen und Künstler, die die Renaissance von Harlem auslösten. Sehen Sie die Highlights der „Doctor’s Row“, in der perfekt erhaltene Brownstone-Häuser an das vergoldete Alter von New York City erinnern, hören Sie den Anblick bahnbrechender Aufführungen im Apollo Theatre, und beenden Sie Ihre Tour mit einem Mittagessen in einem lokalen Restaurant. We have a wonderful experience touring Harlem and the Mount Morris Park Historic District with Carolyn. She has extensive knowledge of the area's history and could easily field any questions we threw at her. She's also very personable so it was just a lovely way to spend our day. WONDERFUL TOUR, CAROLYN IS VERY KNOWLEDGEABLE ABOUT HARLEM HISTORY. SHE HAS AN ENGAGING PERSONALITY AND WELCOMED MY WIFE AND I TO HER NEIGHBORHOOD. WE KNOW WAY MORE NOW ABOUT HARLEM AND WOULD GO ON A FUTURE TOUR WITH HER. IF YOU ARE INTERESTED IN LEARNING ABOUT HARLEM, BOOK YOUR TOUR WITH CAROLYN TODAY! THIS WAS OUR FIRST VISIT TO HARLEM! CAROLYN KNOWS EVERYONE AND SHARES HER STORIES ON THE TOUR. A good trip and the guide very informative and friendly. The Apollo Theatre was interesting but you have to go back for the Theatre's own behind the scenes tour as this isn't included. Would like to try the evening jazz tour another time........The soul food restaurant had an interesting menu. Would have liked to try some of the other options but we enjoyed the lunchtime special menu. Very tasty chicken and I tried the black eye peas which were good. Fabulous tour! Wonderful guide with lots of local knowledge as well as great historical perspective. Highly recommended! A good insight into Harlem with a very knowledgable guide! Soul food at Sylvia's. Really enjoyable. This was an excellent tour. Something out of the ordinary compared with the usual NYC tours. The tour was completed very professionally by the tour guide who was a lifelong Harlem resident. She was enthusiastic and informative having an excellent knowledge of Harlem including its history and the on going development of the area. If you are going to New York do not miss this tour. It will give you a heart warming insight to an often hidden part of the City.